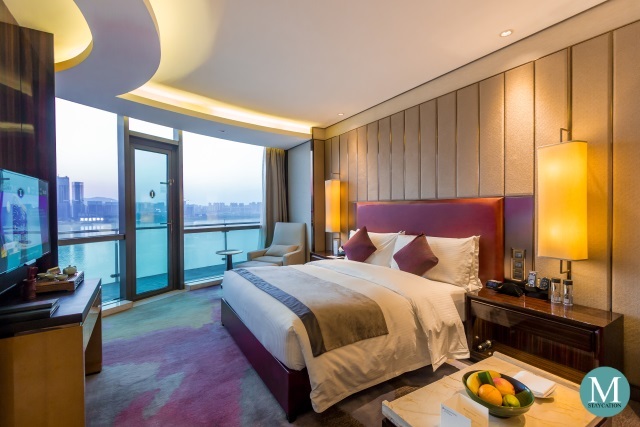 The Club Premier Room is the highest Club InterContinental Room category of InterContinental Changsha. 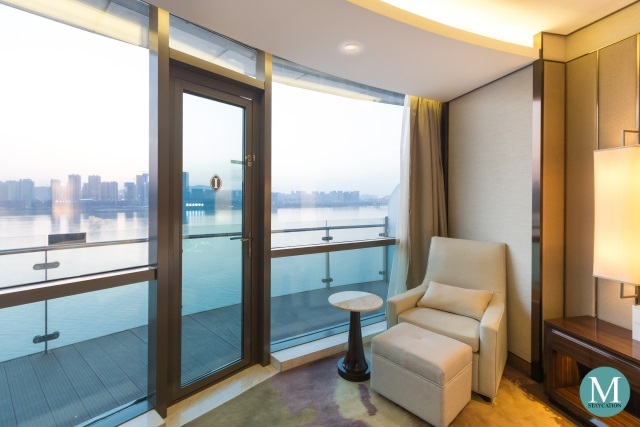 The room has a total floor area of 63 to 71 square meters and features a spacious living space, a semi-partitioned work space, a marble-lined bathroom and a private balcony with 180 degrees view of Xiangjiang River. 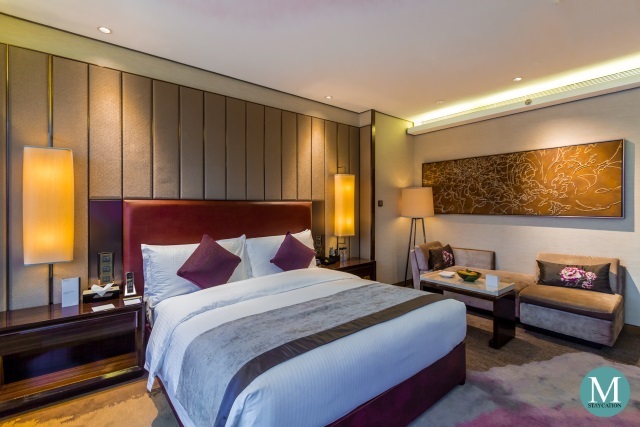 The size and layout of the room classifies the Club Premier Room as junior suite, with a defined sleeping area and sitting area. 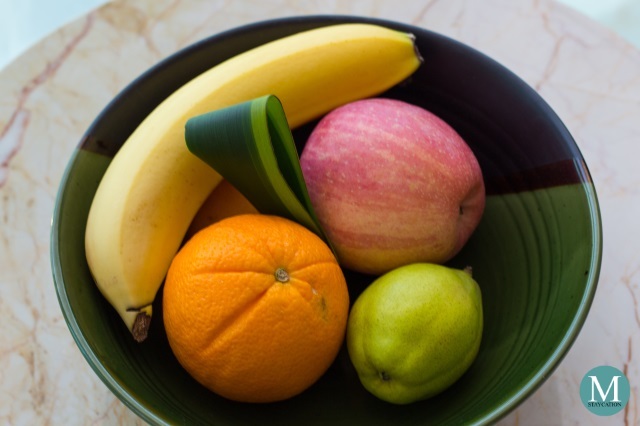 Being a Club InterContinental Room, guests staying in a Club Premier Room receive a fruit platter as part of their welcome amenities. 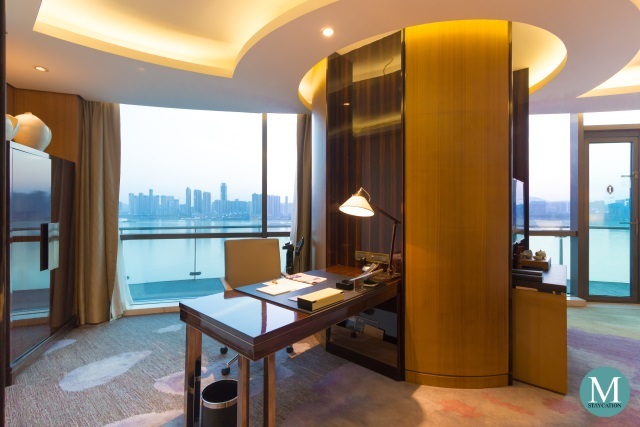 The Club Premier Room also features a spacious, semi-partitioned work station with an executive writing desk complete with InterContinental Hotels branded stationery. The work station also enjoys its own view of the river. 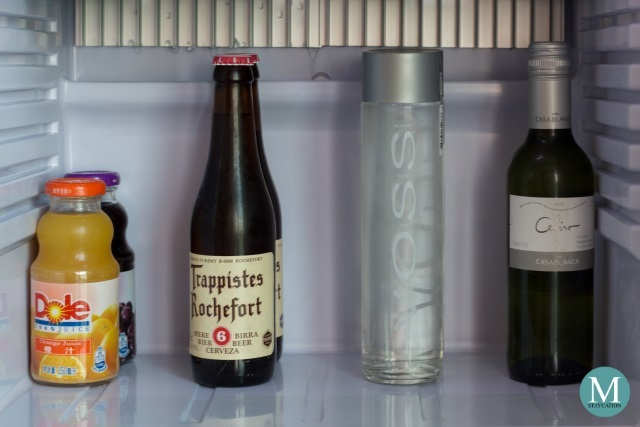 Located next to the work station is a minibar cabinet which houses a mini refrigerator stocked with bottled fruit juices, beer and wine. There's also a selection of liquor and spirits, all of which are chargeable to your room. 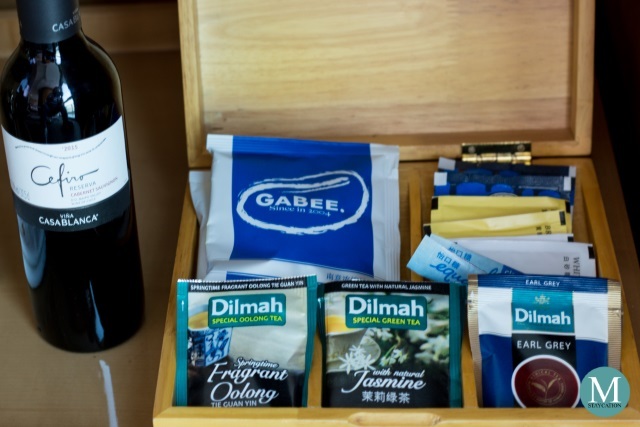 Complimentary items from the minibar are the Dilmah-branded tea bags and the Gabee coffee grounds. There's a French press available should guests wish to brew coffee inside the room. An electronic kettle is also stored inside the cabinet. The Club Premier Room is furnished with a king bed fitted with a very comfortable mattress. The mattress topper was thick enough to add more cushioning to the bed. The sheets are made with high thread-count cotton fabric that is very soft and gentle to the skin. The pillows had a well balanced softness and firmness that contributes to a good sleep quality. Controls to the lights and to the curtains are located next to the bed and over the bedside tables. A cordless telephone is also placed next to the bed. The living area has two couches and a coffee table. 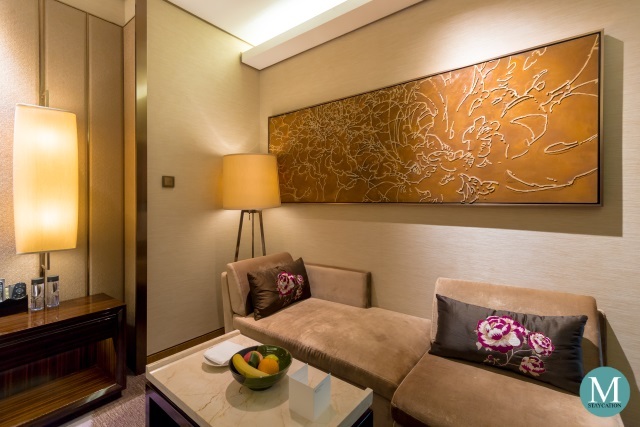 The Club Premier Room is equipped with an an LCD television with exceptional sound system. Both local and international cable channels, including HD channels are available. 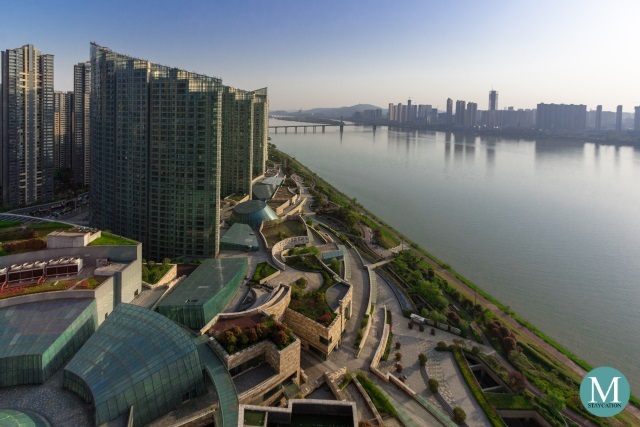 Complimentary wifi as well as cable internet allow guests to stay connected socially and to work during their stay at InterContinental Changsha. 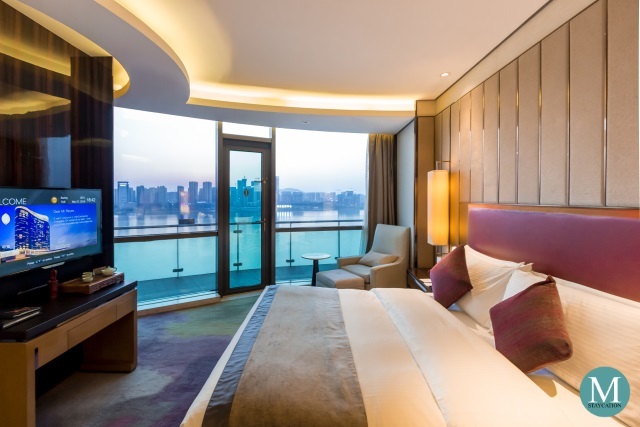 The highlight of the Club Premier Room is definitely the view of the Xiangjiang River. From inside the room, guests can enjoy the view through the floor to ceiling glass wall. Guests can also enjoy the fresh air and the cool breeze at their private balcony. Guests can control the natural light and keep the privacy inside the room by drawing the sheer and blockout curtains with a touch of a button. Equally spacious is the private bathroom. From the foyer, the closet leads directly to the bathroom. A separate water closet is located outside the bathroom, making it possible for two persons to use the water closet and the bathroom simultaneously. The bathroom has a single basin with a spacious marble counter-top. Two sets of toothbrush, toothpaste and mouthwash are part of the complimentary vanity kit provided by the hotel. The walk-in shower is enclosed in glass walls and is fitted with handheld and rainfall shower-heads. Water pressure was strong at any time of the day. It only takes a few seconds to have warm water flowing from the shower. 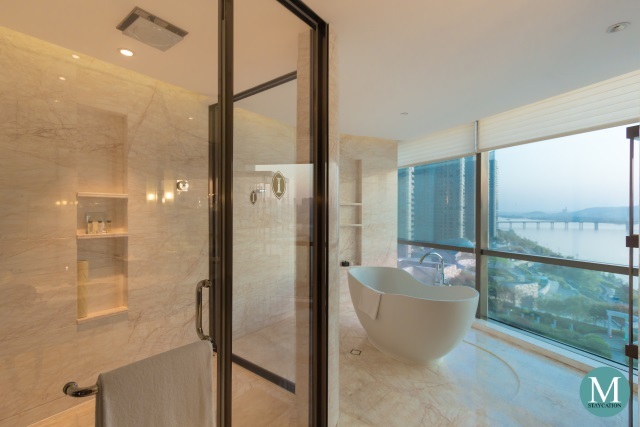 Highlight of the bathroom has got to be the freestanding bathtub located next to the floor to ceiling glass wall. 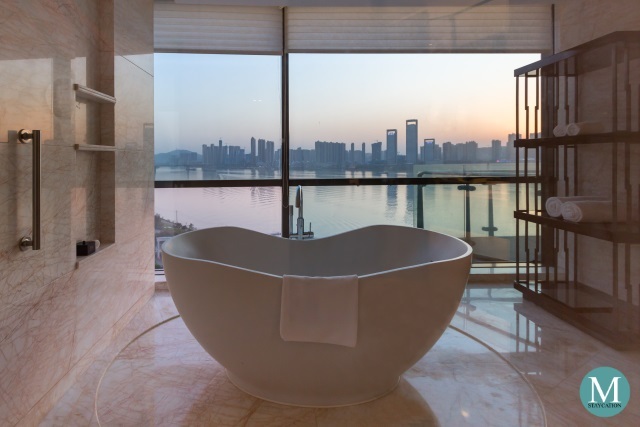 Instead of the Lemon & Verbena body bath amenities by Agraria, which is the standard in all InterContinental properties, guests staying in a Club Premier Room at InterContinental Changsha are treated with an extra touch of luxury with the Bianco di Carrara scented body and bath amenities. 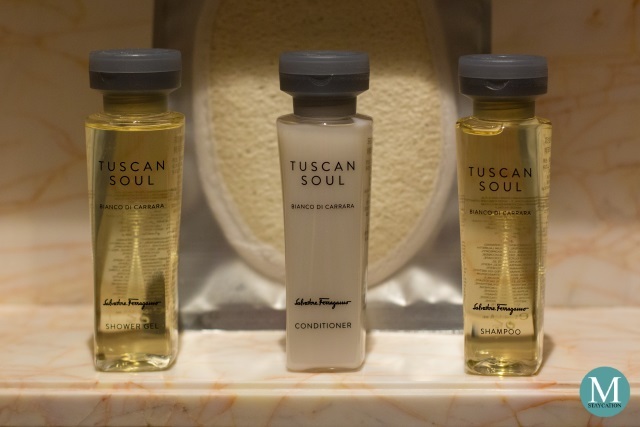 The scent is part of the Tuscan Soul Quintessential Collection of Salvatoe Ferragamo which has a light and creamy notes of fig with hints of white musk.